I saw the title of the post on some shot glasses at Urban Outfitters. They made me do a little lol. 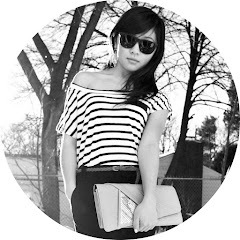 My blog has been added to Okreko Fashion Collective, so that's pretty cool. I find it so funny that the website StumbleUpon sometimes brings you to blogs on Okreko. My best friend used to spend hours just sitting in front of her computer "stumbling." Sometimes even on a Saturday night, but don't tell her I told you that. "What'd you do Saturday night?" "I stumbled." "That drunk huh?" "Not exactly..."
Basically, you click this little button, and it brings you to something really random and interesting on the internet. Biggest. Time. Waster. Ever. Your magical journey through the world wide web will never end. Stumble is amazing! It sure makes classes go by quickly... haha! You look great. I love that those boots look classy with that outfit. Sometimes I feel that over-the-knee boots have a bad rep, but you definitely work it and look great. Love the look, those are amazing boots! I love the boots. you've inspired me to wear them with a blazer. This outfit is so cute! I love your blazer. The color is adorable! AMAZZZZIng boots babe! Love your black and navy combo..you look soo cool!!! Great shades too! Looks like a gorgeous sunny day! very cute-i have that same blazer! That clutch is gorgeous! A great complement to your outfit! I love that clutch! Amazing! stop by my blog for a purse giveaway.. see if its your style! lusting this outfit... gorgeous! Those boots are fantastic! :) Now following you! love that blazer, especially the checkered detail on the cuffs! love this outfit, You are look amazing, and these shoes are awesome, want like pair like yours! great blog! AMO AMO AMO ESTE LOOK! y las botas divinas! !